A 63-year-old diabetic gentleman with microvascular complications presented with advanced azotemia and anemia. He was stabilized with blood transfusion and hemodialysis. With the probable diagnosis of diabetic nephropathy-related end-stage renal disease, he underwent kidney transplantation. He had delayed graft function. Graft biopsy done on the 2nd postoperative day showed acute tubular necrosis. Graft biopsy repeated after 2 weeks for persistent graft dysfunction showed myeloma cast nephropathy (MCN) and light chain proximal tubulopathy. Work-up for multiple myeloma was positive. He was started on plasmapheresis and chemotherapy. However, he suffered sudden cardiac death during dialysis after 1 week. The presence of MCN in the early graft biopsy implies that it must have been the cause for his native kidney failure. Thus, renal failure in a diabetic should not always be presumed to be due to diabetic nephropathy, and kidney biopsy should be done in diabetics with atypical features. Identifying the etiology of end-stage renal disease (ESRD) is important as the disease recurrence can influence post renal transplant (RT) outcome. Hematological malignancies are the most common non-renal neoplasms affecting the kidney and among these, a substantial proportion is due to plasma cell dyscrasia especially multiple myeloma (MM). RT in MM is controversial because of high risk of disease recurrence in the allograft. There are five case reports of primary renal allograft dysfunction due to myeloma cast nephropathy (MCN) with no prior history of plasma cell dyscrasia in the pre-transplantation period,,,,. Only one of these patients had successful graft outcome following chemotherapy. The present case is 6th such case. The diagnosis was missed in the pre-transplant period in present case. This case highlights the importance of establishing the correct etiology of end-stage kidney disease as it can affect the post-transplant outcome. A 63-year-old man, known diabetic for 7 years with blood sugars controlled with oral hypoglycemics presented in October 2015 at a local hospital with mild dull aching upper abdominal pain and no constitutional symptoms. Investigations revealed anemia with hemoglobin of 7 g/dl and serum creatinine of 5.5 mg/dl with normal sized kidneys on ultrasonography. He underwent upper gastrointestinal endoscopy, which was normal. Within 1 week, serum creatinine increased to 10 mg/dl. He did not seek medical advice following this and started taking alternate medications. He remained asymptomatic for the next 6 months after which he developed uremic symptoms. Investigations revealed hemoglobin of 5 g/dl and serum creatinine 15 mg/dl. Tests for hepatitis B, C, and HIV viruses were negative. He was started on maintenance hemodialysis and received packed red blood cell transfusion (3 units) during initial dialysis. He underwent RT at another center with the wife as donor in May 2016. He was induced with anti-thymocyte globulin and maintenance therapy compromised of tacrolimus, mycophenolate mofetil, and prednisolone. He had delayed graft function, which was attributed to intraoperative hypotension. Graft biopsy done on postoperative day 2 showed acute tubular necrosis. He remained oliguric even after 2 weeks and came to our institute for a second opinion. His general and systemic examination was unremarkable except for mild pallor. His blood workup showed anemia (hemoglobin 8.2 g/dl). Tacrolimus Co level was 7 ng/ml. Urine examination was unremarkable. Ultrasound and Doppler of the graft kidney were normal. We advised for a repeat graft biopsy, which showed evidence of MCN [Figure 1] with lambda (λ) light chain restriction [Figure 2] and proximal tubulopathy [Figure 3]. Serum protein electrophoresis did not show any myeloma band while immunofixation electrophoresis showed a discrete band in lambda region. Serum-free light chain assay showed λ predominance, with free λ chain of 8350 mg/L, while free kappa (k) was 39 mg/L (k/λ ratio of 0.005). Bone marrow examination revealed 10% plasma cells. Skeletal survey showed lytic lesion in humerus. Serum calcium was normal. With a final diagnosis of MM with MCN and light chain proximal tubulopathy (LCPT), he was started on plasmapheresis and chemotherapy with bortezomib and high-dose prednisolone. However, the patient had sudden cardiac death during dialysis 1 week after starting chemotherapy. The present report is a case of MCN with LCPT occurring immediate post-RT due to an undiagnosed MM pre-transplant. Various causes of primary renal allograft dysfunction are shown in [Table 1].,, Cast nephropathy due to MM has also been described as a cause of primary renal allograft dysfunction, and five such cases have been reported in literature so far [Table 2].,,,, Our patient had MCN in the early post-transplant kidney biopsy (day 15 post-transplant) suggesting that it might have been the cause for his native kidney failure, and went unrecognized as diabetes was thought to be the cause for his renal failure. Conventionally, renal dysfunction in patients with long-standing diabetes is presumed to be due to diabetic nephropathy, and kidney biopsy is usually not done. However, at present, there is substantial data to show that a significant number of renal disease in diabetic patients is accounted by non-diabetic kidney diseases (NDKD). Various biopsy series in diabetic patients have shown the prevalence of NDKD ranging from 14% to 70%. Studies have demonstrated that the presence of certain atypical features increases the likelihood of finding NDKD in renal biopsies of diabetics. These atypical features include absence of retinopathy, short duration of diabetes (<5 years), presence of hematuria, rapid decline of renal function, massive proteinuria, and presence of symptoms suggestive of another systemic disease. In the largest series of kidney biopsy in diabetic patients by Sharma et al., MCN was seen in 3.6%. The presence of MCN in the early post-RT allograft biopsy suggests that it might have been the cause for native renal failure in our patient and went unrecognized as diabetic nephropathy (presence of albuminuria with fundus showing proliferative diabetic retinopathy and SPEP negative for monoclonal proteins) was thought to be the primary disease. In our patient, atypical features arguing against diabetic kidney disease were anemia disproportionate to renal dysfunction and relatively rapid progression of renal failure. MM is a reversible cause of renal failure when detected in early stages of renal dysfunction. Presentation with advanced renal failure may mask the underlying diagnosis of MM as anemia, bone pains, and loss of appetite is shared symptomatology with chronic kidney disease. MM is often diagnosed during evaluation for unexplained renal disease, and in a study of renal biopsies in elderly patients with acute renal failure, 7% had MCN and 40% of them had previously undiagnosed MM. Although the revised International Myeloma Working Group diagnostic criteria for MM do not include the presence of serum and/or urinary monoclonal protein as one of the criteria, yet serum and urine protein electrophoresis is commonly used as a screening test for MM. However, studies have shown that serum protein electrophoresis fails to detect 50% of light chain myeloma and 20% of significant plasma cell pathologies overall., Even our patient did not have any M spike on serum protein electrophoresis. Thus, a high degree of suspicion should be kept for MM in cases of unexplained renal failure especially in elderly patients, and kidney biopsy should be done in such cases. MM can affect kidneys in multiple ways with MCN being the most common cause of renal failure accounting for 40%–60% of cases., LCPT is a rare entity with biopsy incidence of 0.5%–5% in patients with monoclonal gammopathy.,, It is characterized by presence of crystallized monotypic light chain deposits, usually kappa, within the proximal tubular (PT) epithelial cells. Crystals are evident by electron microscopy within lysosomes of PT cells. Rare cases of lambda LCPT with or without crystals have also been described and similar was the finding in our patient. LCPT may lead to slowly progressive renal failure and recurrence after transplant has also been reported. Combination of different patterns of renal involvement in MM is rare, with most common being monoclonal immune deposition disease with MCN. The coexistence of LCPT and MCN is rare and restricted to case reports.,, The case reports of coexistent LCPT and MCN is shown in [Table 3]. Abnormal LCs secreted by neoplasms differs in Vκdomain, making them resistant to proteolysis by lysosomal enzymes in PT cells. LCs from patients with LCPT characteristically exhibit this property. In addition, excess free LCs secreted by neoplastic cells overload the PT lysosomal system. The tubulopathic LCs have been shown to have low affinity for Tamm–Horsfall proteins, unlike LCs of MCN. The abnormal κ LCs in cases of LCPT have tendency to spontaneously crystallize, unlike λ LCs, which lead to lysosomal dilatation without crystal formation. However, borderline cases in which LCs share both properties could explain dual pathology of MCN with LCPT. The current report is an exceptional co-existence of LCPT and MCN in the immediate post-RT period. In patients with MM presenting with dialysis-dependent renal failure, independent renal function is regained in only <25% cases despite aggressive treatment. While the European Best Practice Guidelines advise a waiting period of at least 2 years between successful induction treatment and RT in patients with MM, the Canadian Society of Transplantation recommends that patients with MM should not undergo kidney transplantation because of high recurrence rate and mortality in recurrent cases. However, the risk of graft recurrence of MCN is low if the disease is in remission. There are a few case reports of successful RT, and combined human leukocyte antigen-matched renal and stem cell transplantation in patients with ESRD due to MCN. To conclude, the present case highlights the importance of establishing a correct diagnosis of renal failure before performing RT. Patients with diabetes mellitus presenting with advanced renal dysfunction should not always be presumed to have diabetic nephropathy and in patients with atypical features, kidney biopsy should be considered. Serum and urine protein electrophoresis alone should not be used to rule out monoclonal gammopathy, and in patients with high suspicion, a detailed workup including immunofixation electrophoresis and serum-free light chain assay should be done. Lingaraj U, Vankalakunti M, Radhakrishnan H, Sreedhara CG, Rajanna S. A case of primary renal allograft dysfunction due to myeloma cast nephropathy. Saudi J Kidney Dis Transpl 2015;26:970-5. Geiger X, Harris D, Van Buren D, Goral S, Helderman JH, Fogo A, et al. A middle-aged woman with refractory graft dysfunction in the early posttransplant period. Am J Kidney Dis 1999;33:998-1003. Foster K, Cohen DJ, D'Agati VD, Markowitz GS. Primary renal allograft dysfunction. Am J Kidney Dis 2004;44:376-81. Perkowska-Ptasinska A, Glyda M, Paczkowski M, Durlik M. Primary kidney allograft dysfunction due to myeloma-cast nephropathy: A case report. Transplant Proc 2007;39:1683-4. Goel SK, Granger D, Bellovich K, Marin M, Qu H, El-Ghoroury M, et al. 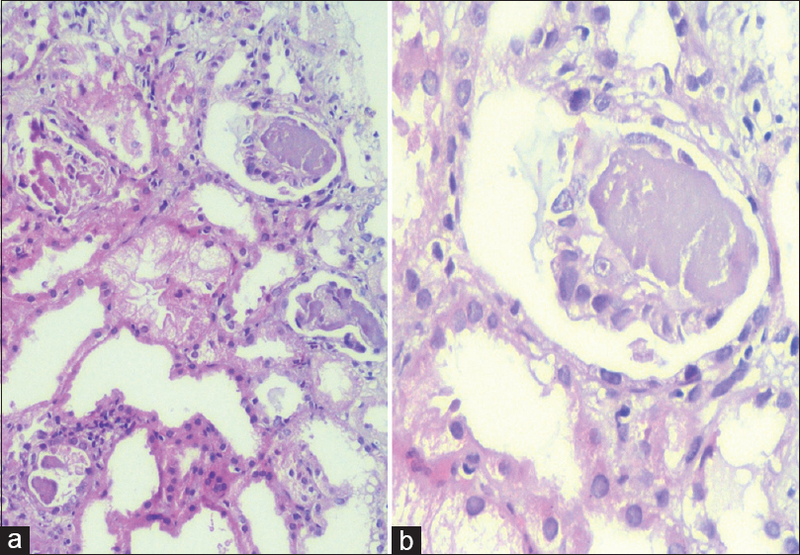 Myeloma cast nephropathy: A rare cause of primary renal allograft dysfunction. Transplant Proc 2011;43:2784-8. Griffin EJ, Thomson PC, Kipgen D, Clancy M, Daly C. Early focal segmental glomerulosclerosis as a cause of renal allograft primary nonfunction. Case Rep Transplant 2013;2013:565697. Parasuraman R, Zhang PL, Samarapungavan D, Pothugunta K, Reddy G, Rocher L, et al. Primary nonfunction of renal allograft secondary to acute oxalate nephropathy. Case Rep Transplant 2011;2011:876906. Gonzalez Suarez ML, Thomas DB, Barisoni L, Fornoni A. Diabetic nephropathy: Is it time yet for routine kidney biopsy? World J Diabetes 2013;4:245-55. Espinel E, Agraz I, Ibernon M, Ramos N, Fort J, Serón D, et al. Renal biopsy in type 2 diabetic patients. J Clin Med 2015;4:998-1009. Sharma SG, Bomback AS, Radhakrishnan J, Herlitz LC, Stokes MB, Markowitz GS, et al. The modern spectrum of renal biopsy findings in patients with diabetes. Clin J Am Soc Nephrol 2013;8:1718-24. Haas M, Spargo BH, Wit EJ, Meehan SM. Etiologies and outcome of acute renal insufficiency in older adults: A renal biopsy study of 259 cases. Am J Kidney Dis 2000;35:433-47. Katzmann JA, Dispenzieri A, Kyle RA, Snyder MR, Plevak MF, Larson DR, et al. 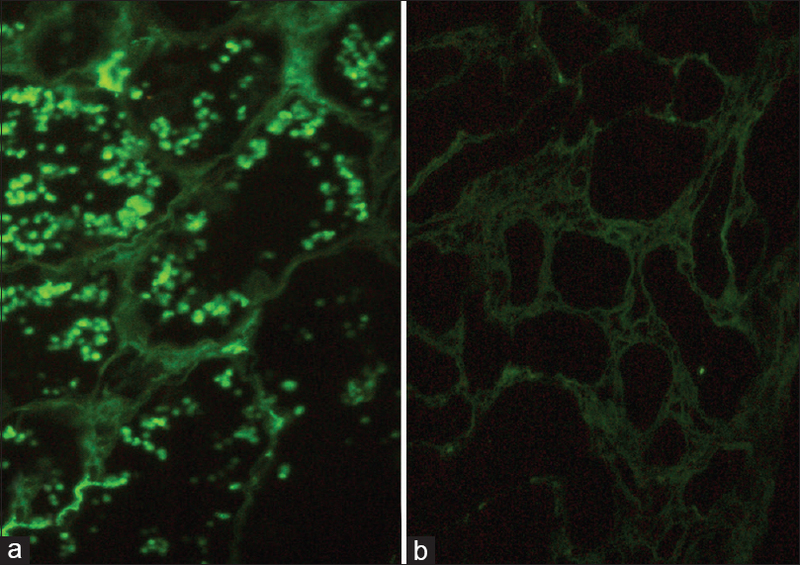 Elimination of the need for urine studies in the screening algorithm for monoclonal gammopathies by using serum immunofixation and free light chain assays. Mayo Clin Proc 2006;81:1575-8. Drayson M, Tang LX, Drew R, Mead GP, Carr-Smith H, Bradwell AR, et al. Serum free light-chain measurements for identifying and monitoring patients with nonsecretory multiple myeloma. Blood 2001;97:2900-2. Wirk B. Renal failure in multiple myeloma: A medical emergency. Bone Marrow Transplant 2011;46:771-83. Nasr SH, Valeri AM, Sethi S, Fidler ME, Cornell LD, Gertz MA, et al. Clinicopathologic correlations in multiple myeloma: A case series of 190 patients with kidney biopsies. Am J Kidney Dis 2012;59:786-94. Larsen CP, Bell JM, Harris AA, Messias NC, Wang YH, Walker PD, et al. The morphologic spectrum and clinical significance of light chain proximal tubulopathy with and without crystal formation. Mod Pathol 2011;24:1462-9. Herrera GA. Proximal tubulopathies associated with monoclonal light chains: The spectrum of clinicopathologic manifestations and molecular pathogenesis. Arch Pathol Lab Med 2014;138:1365-80. Stokes MB, Valeri AM, Herlitz L, Khan AM, Siegel DS, Markowitz GS, et al. Light chain proximal tubulopathy: Clinical and pathologic characteristics in the modern treatment era. J Am Soc Nephrol 2016;27:1555-65. Gallan AJ, Khalighi MA. 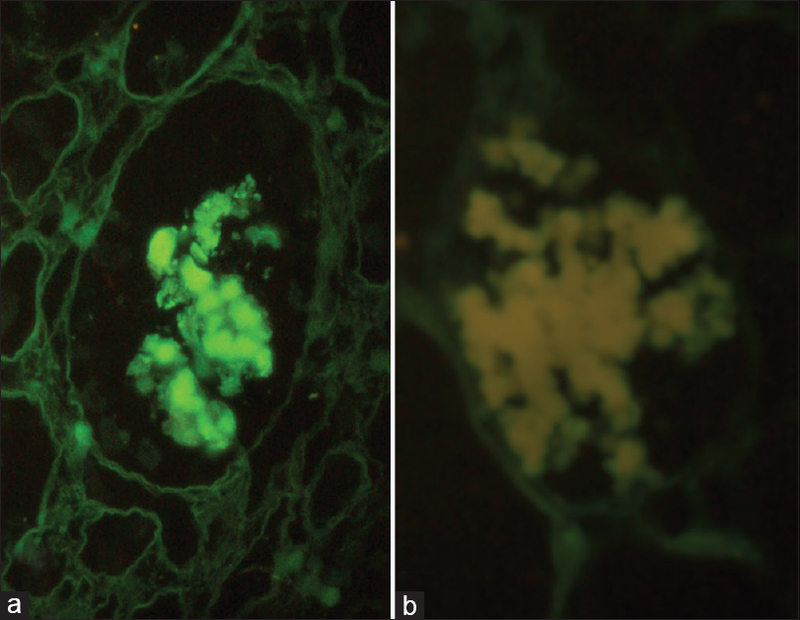 Lambda light chain crystalline cast nephropathy and proximal tubulopathy. Kidney Int Rep 2016;1:316-20. Angioi A, Amer H, Fervenza FC, Sethi S. Recurrent light chain proximal tubulopathy in a kidney Allograft. Am J Kidney Dis 2016;68:483-7. Gowda KK, Joshi K, Nada R, Ramachandran R, Sachdeva M. Light chain proximal tubulopathy with cast nephropathy in a case of multiple myeloma. Indian J Nephrol 2015;25:119-22. Messiaen T, Deret S, Mougenot B, Bridoux F, Dequiedt P, Dion JJ, et al. Adult Fanconi syndrome secondary to light chain gammopathy. Clinicopathologic heterogeneity and unusual features in 11 patients. Medicine (Baltimore) 2000;79:135-54. Sharma SG, Bonsib SM, Portilla D, Shukla A, Woodruff AB, Gokden N. Light chain proximal tubulopathy: Expanding the pathologic spectrum with and without deposition of crystalline inclusions. ISRN Pathol 2012;2012:6. Basnayake K, Stringer SJ, Hutchison CA, Cockwell P. The biology of immunoglobulin free light chains and kidney injury. Kidney Int 2011;79:1289-301. EBPG (European Expert Group on Renal Transplantation), European Renal Association (ERA-EDTA), European Society for Organ Transplantation (ESOT). European best practice guidelines for renal transplantation (part 1). Nephrol Dial Transplant 2000;15 Suppl 7:1-85. Knoll G, Cockfield S, Blydt-Hansen T, Baran D, Kiberd B, Landsberg D, et al. Canadian Society of Transplantation consensus guidelines on eligibility for kidney transplantation. CMAJ 2005;173:1181-4. Bansal T, Garg A, Snowden JA, McKane W. Defining the role of renal transplantation in the modern management of multiple myeloma and other plasma cell dyscrasias. Nephron Clin Pract 2012;120:c228-35.